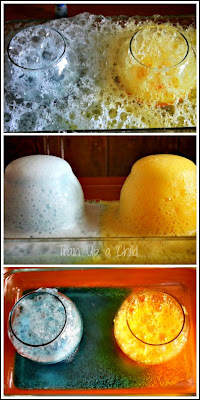 A couple weeks ago I shared how to make colored ice for sensory play. I saved six cubes in each primary color for an experiment in color theory that I first saw on Red Ted Art. JZ (6) and I have been enjoying a variety of water science experiments lately, so I knew he'd be fascinated watching color mixing with ice. This simple science experiment for kids is perfect for exploring color theory. I set out the colored ice in separate containers and asked JZ to think about what possible color combinations he could make with red, yellow, and blue. After thinking it over he started with red and blue, predicting that they would make purple. He combined blue and yellow in the second jar and yellow and orange in the third. 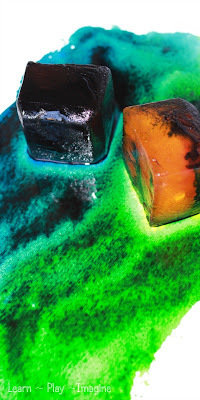 What he wanted to do most of all was to see what would happen with all three colors, so he mixed the remaining ice cubes in one of the plastic containers and left it out in the sun with the jars. The great thing about this experiment in color theory is that it requires patience. Each time we checked on the jars of ice we noticed little changes, but it took several hours to really see the results. With younger children I recommend doing this water experiment on a hot day for quicker results. One interesting thing we noticed is that since JZ layered some of the colored ice cubes in alternating colors, the tint of the water was different each time we checked on it. I think JZ secretly enjoyed his murky brown combination the most. Look how cool the different shades and combinations are as they melt. 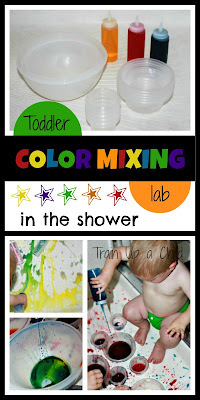 We love simple science experiments, and this was the perfect project for a stay at home day. Tank and Peanut (36 months) exercised great self control by not touching the glass jars while we waited for the ice to melt. 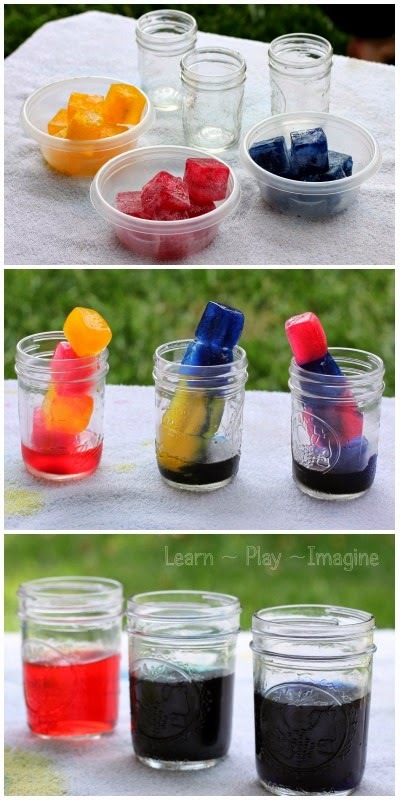 Once the ice had fully melted and the colors mixed, I poured the colored water into plastic containers and let them play. For more ways to explore color theory follow me on Pinterest.